One would presume that startups operating online businesses would rely heavily on online advertising to get noticed. And while that is true, they are also now experimenting with some unique advertising platforms to capture mindshare. Step out of the internet and on to the road and you’re sure to spot a billboard, hoarding or a unique out-of-home advertising prop plugging an ecommerce startup holding their own against the more established brands. While advertising through billboards, hoardings and usually any offline methods is considerably more expensive ( read: up to a million bucks for a months’ spot on a prime location billboard) than online advertising, flush with VC funding, most of the hot startups wouldn’t mind shelling out the dough to create a brand recall and stand out from the clutter. And just as well. It makes perfect sense to not only capture the ready online audience, but also onboard and engage a potentially huge and captive offline audience on your platform. In an exclusive feature, here’s a roundup and analysis of some of the most interesting examples of offline and outdoor advertising by online startups and ecommerce players. When Flipkart had ads for its #AcchaKiya campaign all over the billboards, little did it expect to get trolled like this. Rival Snapdeal placed a billboard with a cheeky comeback right below! The hoardings were soon followed by photoshopped versions, by various brands, each cheekier than the last, becoming a viral meme. 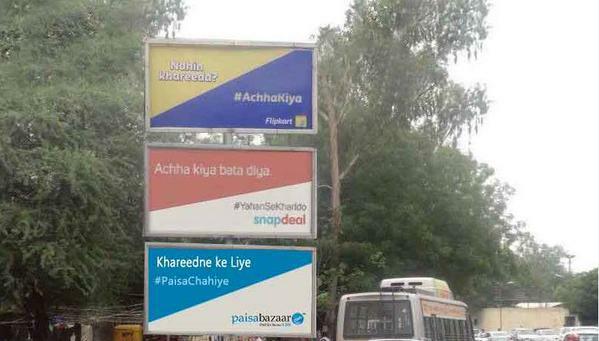 Flipkart locks horn with Snapdeal in this hoarding war. To promote their respective discount sales during Diwali, the 3 biggies in the Indian ecommerce sector had brought out full-page ads in leading dailies on the same day, making for some very ad-heavy newspaper reading on the day. However, newspapers and billboard advertising is not the only offline route the startups are taking for their branding needs. Here are some interesting OOH (Out Of Home) attempts. 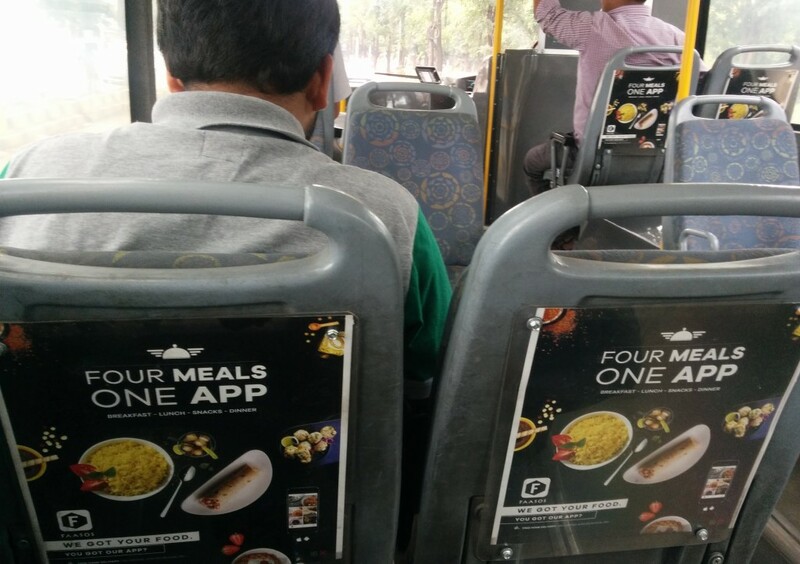 The food tech restaurant is using the back of the seats of local buses as billboards. Considering that most of its audience is young, office going population, makes sense to invoke their hunger and create top of mind recall just before opportunities for ordering in food at office come up. 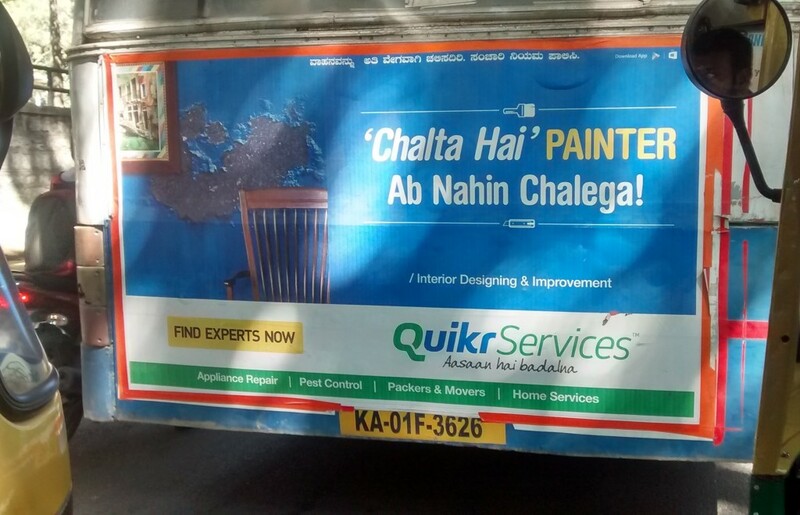 Buy and sell classified ads platform Quikr is using the backs of the ubiquitous local buses well by promoting its newly launched local home services arm. 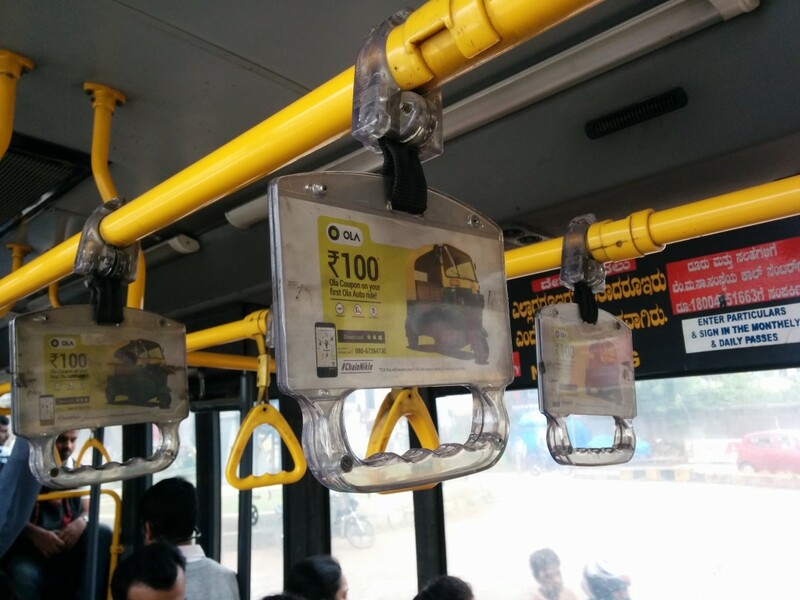 Ola has found a perfect advertising hack in a most curious prop – the grab handles in a bus. A perfect reminder for every time when you stand in a crowded bus, better just take an Ola auto instead. 6. Grabhouse bridging the gap. 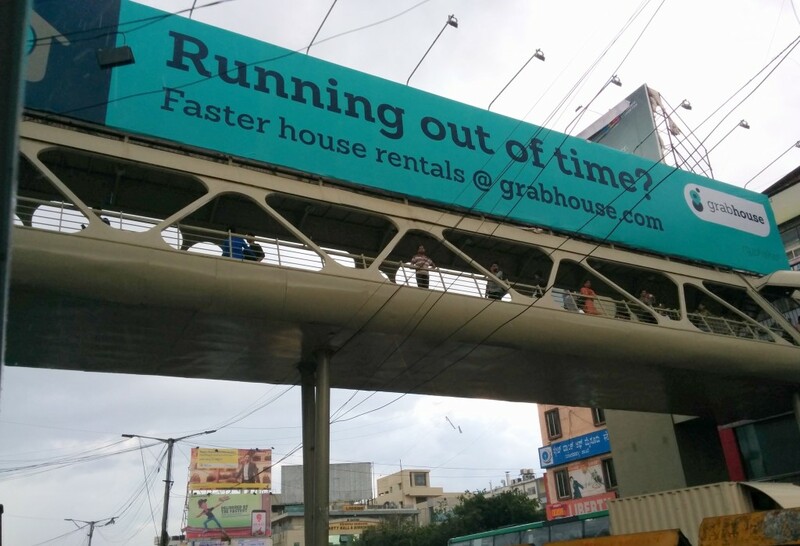 Real estate portal Grabhouse has aptly put a hoarding promoting its house rentals services on a footover bridge. 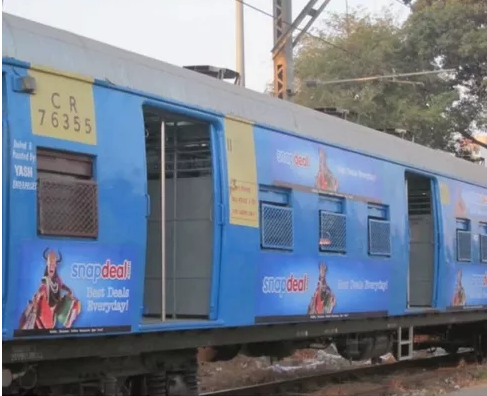 Snapdeal has taken mass advertising to an altogether different level with an outdoor campaign that involves ad wraps on local trains in Bombay and on buses in Rajasthan. 8. Lenskart’s got their backs. 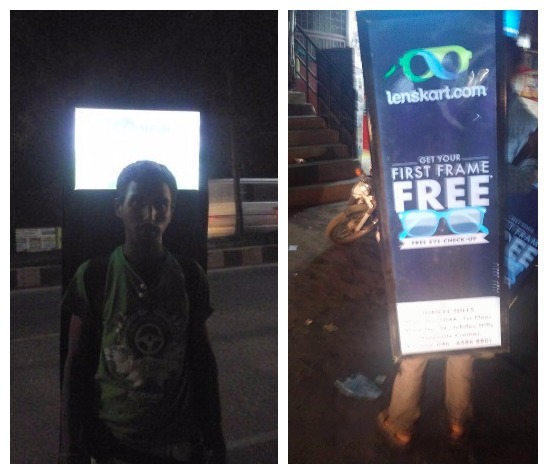 Lenskart has its army of foot soldiers carrying these LED hoardings strapped on their backs, ensuring eyeballs as they stride on in the city streets. But those who miss these, are probably the ones who need Lenskart the most! 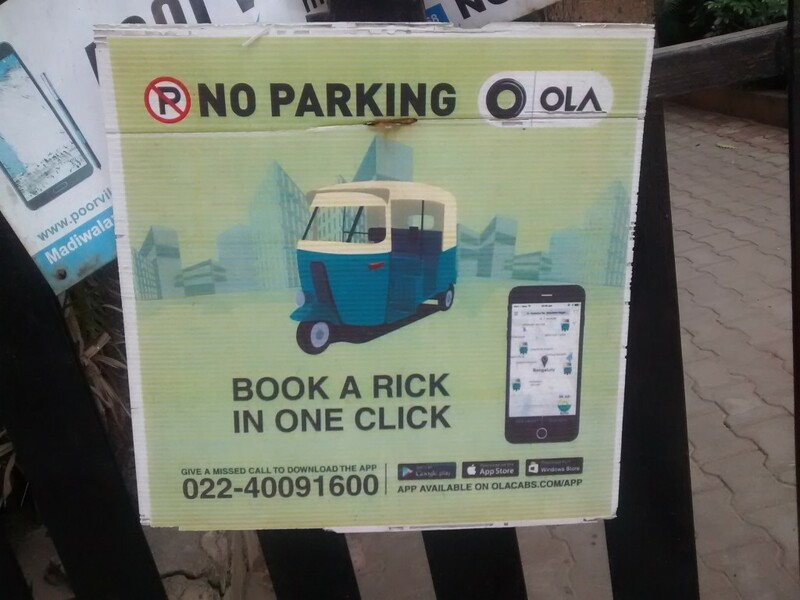 Ola tries an old advertising hack with the No Parking signboard on residence gates, quite cleverly plugging the point that with an Ola, one doesn’t need to bother with the parking. If your primary audience is young, urban, upmarket crowd, it doesn’t make more sense than to advertise at a music festival with over 5000 footfalls. 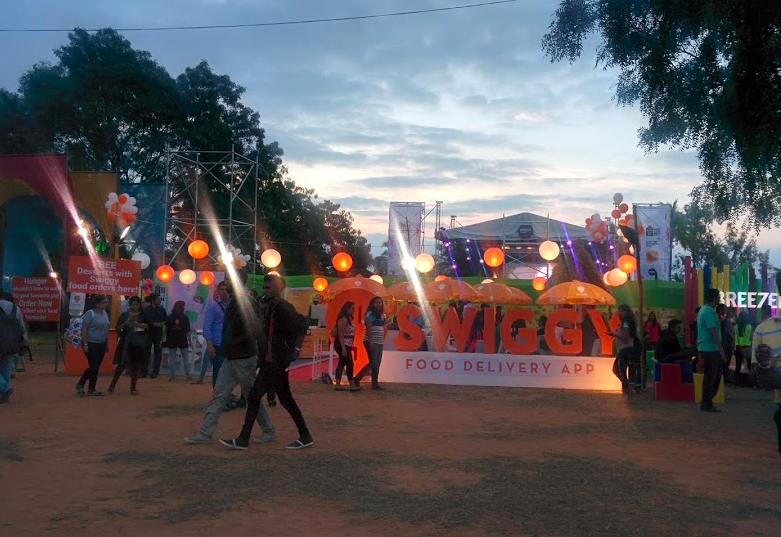 Swiggy was one of the sponsors for the hugely popular NH7 Weekender music festival, and other than a makeshift cafe at the venue, Swiggy had its branding placed right at the entrance, ensuring instant eyeballs and recall at the festival. 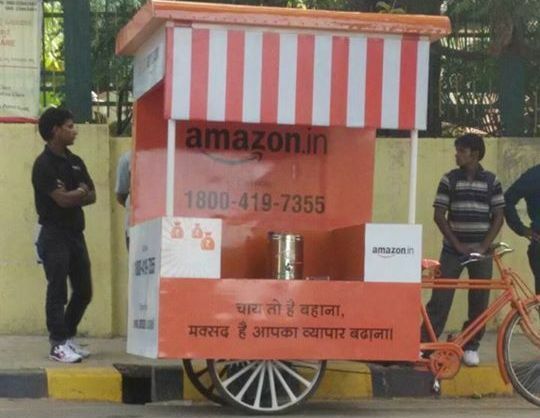 Piloting in Bangalore, Amazon’s using these Chai carts to spread awareness about the company among local entrepreneurs and sellers in small cities and towns. These tea stalls stationed at strategic points in a city will offer free cups of tea and conversations around getting businesses online.